Just as the Planning Board looked close to taking a vote on a major development plan for the Forbes site Tuesday night, Dec. 18, the attorney for developer YIHE asked the board to give his client another month to review potential changes to the project. Paul Feldman, the attorney for the developer, requested a one-month continuance of the public hearing on the project after City officials, including City Manager Thomas Ambrosino, recommended decreasing the density of the residential units on the site. Developers were seeking 630 studio, one-, and two-bedroom units in a mix of buildings on the property, along with 963 parking spots, and 20,000 sq. ft. of office, commercial, and retail space. Chinese company YIHE purchased the 18-acre former Forbes Lithograph Manufacturing site, bordered by the Chelsea River and Mill Creek, in 2014 for just over $11.5 million. In 2015, the City rejected a far-reaching plan for the site that included skyscrapers more than 20 stories tall and more than 1.5 million square feet of residential and commercial development. “The current proposal is more than half the size smaller than the one three years ago at 699,000 square feet,” said Feldman. During a nearly three-hour public hearing Tuesday night, Ambrosino gave the project his qualified support, stating he approved of the developer’s plans to allow waterfront access to the public through a three-acre waterfront park. He also supported their willingness to work with the city on affordable housing levels and the plan to build 60 percent of the units as condominiums, dramatically helping to increase home-ownership levels in Chelsea. “This is the first significant home ownership project to come to the city since I started here three-and-a-half years ago,” said Ambrosino. However, the city manager said the project is too dense for the neighborhood, and asked the Planning Board to recommend to the Zoning Board of Appeals that the project be limited to 550 residential units. He also asked the ZBA to stipulate that 10 percent of the units in the project be set aside as affordable units at 50 percent of the annual median income. “I advocate that outright denial would not be in the best interest of the city,” said Ambrosino. He noted that 630 units could be approved by right on the 18-acre parcel provided there were more parking spaces than the number proposed by YIHE. During the public hearing, Feldman said the developer was willing to work with the city on affordable housing. With the recommendation to reduce the number of units, however, the attorney said his client would need more time to review the conditions. “Given the enormous amount of information we have heard tonight, we do not want to be rushed,” said Feldman. During the hearing, most of the questions from the board and the public revolved around some of the usual suspects with any large development — safety, traffic, and parking. A good portion of the evening was dedicated to a traffic study conducted by the developer’s engineering firm. Jeff Dirk of Vanasse and Associates said there would be a traffic impact from the 630 units, but that it would top out at about 200 vehicle trips during peak hours around 1 Forbes Street. He also noted that once traffic exited the development over one of two proposed new bridges to the site off Crescent Avenue, it would be dispersed throughout a number of thoroughfares throughout Chelsea, cutting down on overall congestion. “It will be a relatively minor increase (in traffic) as you get away from the site,” said Dirk. Feldman said the developers will work with the City to make infrastructure and traffic improvements in the area, including to Crescent Avenue itself. In addition, he said YIHE will work with the MBTA to improve public transportation to the site and the surrounding neighborhood. While a dedicated bus stop is likely years away, Feldman said developers will provide a shuttle bus service to the nearest MBTA bus stops and the Silver Line for residents of the development and the neighborhood. But some people Tuesday night, including District 3 City Councillor Joe Perlatonda, said the development team was painting too-rosy a picture of the traffic and parking impact on the surrounding neighborhoods. “This is in my district and I am still not on board,” said Perlatonda. As it stands, the councillor said pedestrians dodge traffic on Crescent Avenue, and backups in the area can be severe, particularly during school drop-off and pick-up hours. Several residents and Planning Board members were also concerned about the two new planned bridges, questioning if they were too close together in case of emergency. Feldman said a wider bridge would be for vehicles and a narrower one would be primarily for pedestrians, but could be used for emergency access by the police and fire departments. However, Planning Board member Gladys Vega said she was worried that there could be issues in an emergency because the bridges are essentially side by side, with no other access point to the development. City Council President Damali Vidot raised concerns about the density of the project, as well as the lack of three-bedroom apartments in the initial plans. The Planning Board will take up the public hearing on 1 Forbes St. at its January meeting. Feldman said he will also be asking for a continuance from the ZBA, which needs to grant a special permit to allow for fewer parking spots than are required under zoning for the Waterfront District. There has been no shortage of colorful language used to express frustration for the often ill-timed Chelsea Street Bridge closures, and now the MBTA has joined the chorus in cursing the 250-foot vertical lift bridge – a bridge that far-too-often makes a lift in the dead of rush hour traffic. At the MBTA Fiscal Management Control Board (FMCB) meeting on Monday, Kate Fichter – Assistant MassDOT Secretary for Policy Coordination – said that the Silver Line extension to Chelsea has been a great success, but the delays at the critical crossing of the Chelsea Street Bridge have stifled the new service. A plan put in place to warn Silver Line drivers in advance of a bridge closure has not worked out very well, she said, and the Silver Line’s growth is believed to be hampered by people frustrated with the bridge delays. Fichter said they are working with MassPort and several other partners to propose a six-month pilot program to the Coast Guard’s Maritime Regulations on the bridge. Those regulations prioritize maritime travel over all other forms of transportation and often result in ships coming through at the worst times of the day. That has caused problems for MassPort workers trying to get to and from the employee parking garage in Chelsea from the airport, and it’s also caused problems for parents trying to get to Chelsea to pick up their children from school or day care. Likewise, it is a constant headache for commuters and commercial/industrial ventures when it goes up. The exception would be if a fully loaded petroleum tanker sought to come into the Chelsea Creek or there was an emergency situation. The purpose of the pilot program would be to collect data on MBTA delays, as well as delays for other users. She said the goal would be for the multiple agencies to seek a permanent regulation change with the Coast Guard if the pilot shows improvements. That, she said, is a tough road to travel and would likely get resistance from maritime uses on Chelsea Creek. Fichter said they would be having public meetings in the new year at some point to get input from the community, and they are encouraging everyone to come out and voice their frustrations with the bridge as it is set up now. The more people that voice their opinions, the more likely it will be that the pilot would be put in place. She said they would like to see any approved pilot program start in June 2019. MBTA officials reported this week that Silver Line ridership for the new Chelsea service has been growing steadily since implementation last April. Members of the MBTA’s Chelsea Task Force reported to the Fiscal Management Control Board (FMCB) on Monday that ridership on weekdays has grown by nearly 2,000 riders per month. The service started with about 4,100 riders per month on weekday at the outset, and now boasts around 6,200 riders per month on weekdays. At other times, though, ridership has stayed flat. On Saturdays, ridership started around 3,000, grew to nearly 4,000 riders and has now declined to about 3,200 riders. On Sundays, ridership started at about 2,900 and surged to about 3,000 riders in August, but has now declined to about 3,800 riders per month. 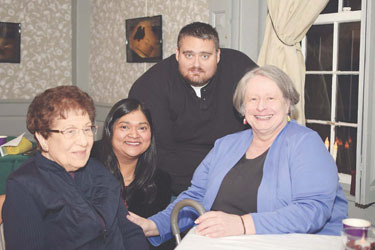 The Bellingham-Cary House held its annual Holiday Open House on Saturday evening, Dec. 7, with a good turnout of residents coming to celebrate the holidays in the historic home. Pictured here are the Board of Trustees: Jean Chapman, Corresponding Secretary; Faye Dookharan, Treasurer; Matt Frank, and Karen MacInnis, President.